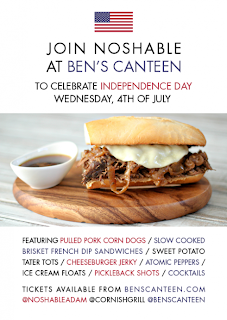 To mark Independence Day, Ben's Canteen is holding a special supper club with Noshable. 3 courses and great food for a fixed price. 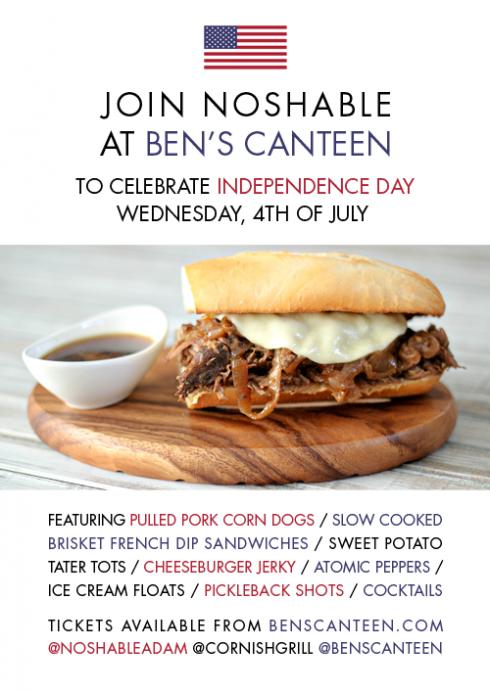 "Here at Ben’s Canteen we champion British things but on the 4th July we’re teaming up with Noshable and breaking free to bring you an awesome Independence Day dinner (albeit using amazing British produce from @cornishgrill). So join us for the Noshable feast, where classic American diner dishes will do battle with the finest Cornish ingredients. Joins us for a rowdy night of soul food, ‘house party’ cocktails and as many pickleback shots as you can handle. Tickets cost £30 and include the following menu, a ‘house party’ cocktail and a portion of Billy Frank’s original cheeseburger jerky. Starter - Rare breed pulled pork corn dogs w/atomic peppers and a coffee-infused barbecue sauce dip. Main - Slow cooked dry aged Cornish beef brisket in a French Dip sandwich w/sweet potato ‘tater tots’ and slaw. Dessert - Root beer float w/Cornish vanilla ice cream."